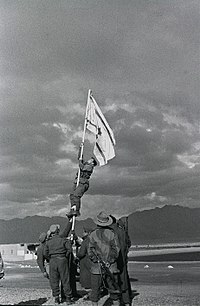 Captain Avraham "Bren" Adan raisin the Ink Banner at Umm Rashrash (a steid nou in Eilat), markin the end o the war. The 1948 Arab–Israeli War or the First Arab–Israeli War wis focht atween the State o Israel an a militar coaleetion o Arab states. ↑ This includes the entire militar personnel coont—baith combat units an logistical units. ↑ At maximum, nae hauf o the forces o the Israelis but these numbers include anly the combat units sent tae the umwhile mandate-territory o Palestine, nae the entire militar strenth. ↑ Politics and society in modern Israel: myths and realities. Google Books. 2000. ISBN 9780765605146. Retrieved 28 March 2011. Wikimedia Commons haes media relatit tae 1948 Arab-Israeli War.